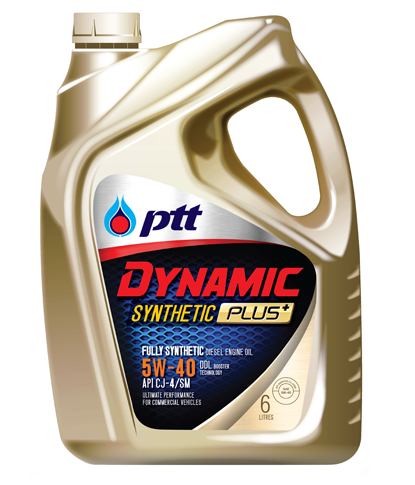 [DYNAMIC SYNTHETIC PLUS] น้ำมันเครื่องสังเคราะห์ 100% คุณภาพสูงสุด ผสมผสานเทคโนโลยี DDL Booster เหมาะสำหรับเครื่องยนต์ดีเซลสมรรถนะสูงพิเศษ รุ่นใหม่ ที่มีมาตรฐานการปล่อยมลพิษไอเสีย Euro IV ขึ้นไป Ultra-premium fully synthetic diesel engine oil with DDL Booster technology. Formulated for ultimate performance of modern diesel vehicles meeting ultra low exhaust emission standard above Euro IV. • Designed for high performance common rail diesel engines of Pick up Trucks and SUVs (PPVs) with both of 2WD and 4WD and also for modern diesel vehicles meeting ultra low exhaust emission standard up to Euro V and compaitble to all after-treatement device such as DPF, SCR. • Recommended for all models of diesel pick up trucks and also for commercial vehicles where require SAE 5W-40 and API CJ-4 or lower.